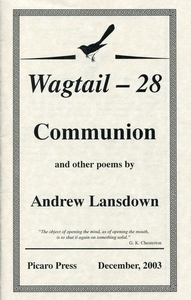 Andrew Lansdown’s poetry is sometimes described as ‘traditional’, in the sense that he often draws on the devices and styles of earlier Imagist poets. He can also write with a warm religious sensibility, and the theme of family is never far from his thoughts. Always accessible and direct, his poems re-cast the familiar in a way that compels the reader to notice and reconsider what might otherwise be taken for granted. Between Glances won the 1994 Adelaide Festival John Bray Award; his writing includes non-fiction, short fiction and novels. Lansdown is very much a West Australian poet. He has worked as a journalist and teacher, including time as an Education Officer in the WA prison system. He lives in Dianella with his wife and family. when fused, infused with the sap’s green push. One, on its plane, bears sugar and grain. the dark dregs of last winter’s light rain. a bath. A fantail alights to flirt. a fall of rolled oats. Be still. Don’t speak. breaking a white wafer with his beak.